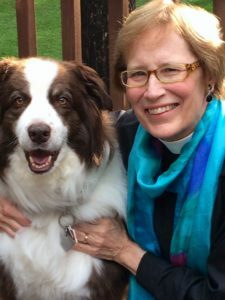 Lindsay Hardin Freeman has been a priest for over thirty years and is currently the interim rector at St. Nicholas Church in Richfield, Minnesota. 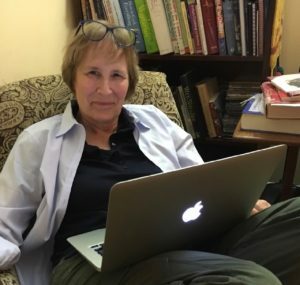 She is the author of eight books, including The Spy on Noah’s Ark, The Spy at Jacob’s Ladder, and Bible Women: All Their Words and Why They Matter. 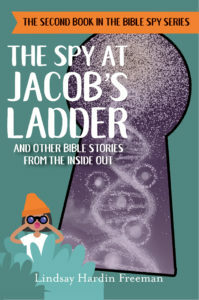 Her most recent publication with Forward Movement, The Spy at Jacob’s Ladder, is a collection of your favorite Bible stories, told from a unique perspective. She worked on this book with talented illustrator Paul Shaffer, who has recently departed, may his soul rest in peace. I began writing as a teenager, when my 8th and 9th grade English teacher required us to write 75 words a day, then 150 words. Middle school is such a horrible time for most kids, and it certainly was for me. I poured out my heart on paper. The fact that someone read what I had to say made all the difference. And you know what? You could say that about readers who read what I write today. The fact that someone is listening and willing to explore what I’ve written makes all the difference. When I’m deeply into a writing project and making progress, that makes me happy. I think that writing is a calling from God and I’m happiest when I’m getting words on paper that others will read, that will make a difference, that will help keep the faith alive for future generations. I’m also a parish priest, and it’s hard to be faithful to the writing life while teaching, preaching, and being a pastor because it all requires significant emotional labor…. so what makes me happy is to be making progress. The most difficult part is what it always is—finishing the book! It’s easy to start a book, but hard to take it all the way through to the end. To diligently go from start to finish, to take apart stories, if needed, with a buzzsaw until you get them right—it’s a labor of love. I’m fortunate in that I’m married to a writer and fellow priest, Len Freeman, who knows his Bible well and always has new ideas…and seems never to tire of reading what I write and helping the stories to be even better. My goal is to get up early and write for an hour early in the morning, usually curled up in a living room chair after I’ve fed the dog. If I have that discipline down, characters and ideas are freed to run around in my head most of the day. Sometimes I’ll only get a half dozen paragraphs done in that early morning hour, but progress is always better if I’m on track. The funny thing that I find about writing is that it’s physically exhausting. I’m always tired when I set down my laptop, but that’s also usually a sign that I’ve accomplished something. I wrote the first volume of The Spy series in Hawaii, while serving St. Jude’s Church on the Big Island. Now if I need inspiration, I go to northern Minnesota along Lake Superior. What would you do if you felt stuck while writing? If I get stuck on a sentence—which happens often—I get up and walk around. I put the laundry in, get the mail, pet the dog, admire my garden…but I come back and sit down and keep writing. It looks like I’m not doing anything as I wander around the house or go out in the yard, but I’m thinking, musing, creating. The Bible is right up there on the top of my list, and that’s a good thing, because I spend so much time with it. In terms of children’s books, I’ve always loved The Princess and the Goblin, written by George MacDonald, of whom CS Lewis said, “He baptized my imagination.” The Little House books by Laura Ingalls Wilder are a favorite series, as are the Uncle Wiggly books, written from about 1912 – 1927 by Howard Garis. It means a great deal to me when people say they’ve loved a book I’ve written, or when they share a story that the book has inspired. I will never take a reader for granted, and am honored to be a part of their reading life.